In 1998, there were two asteroid blockbusters released. First, there was the brilliant ‘Deep Impact’, directed by Mimi Leder (‘The Peacemaker’), and starring Morgan Freeman, Robert Duvall, Tea Leoni and Elijah Wood. This movie followed a more natural story line, of a four-year plan to save the world from impending destruction, as a massive asteroid heads for earth. This is were ‘Deep Impact’ drew great reviews from film critics, and also was applauded for being more realistic than the asteroid/ meteorite movies that came before it. It is a truly brilliant movie, with great performances from its leading cast, and a spectacular finale. But enter Michael Bay. And exit realism, for thrills, spills and laughs instead. Hot on the trail of ‘Deep Impact’, the latest venture from Michael Bay and Jerry Bruckheimer hit cinema screens with its own asteroid-esque power… ‘Armageddon’. Bay, Bruckheimer and the team of heavy-hitting writers (Including JJ Abrams and Tony Gilroy) threw out as much realism as possible, replacing it with action and special effects that ‘Deep Impact’ simply could never compare to. With an asteroid “the size of Texas” hurtling straight towards our planet, the skills of a drilling crew are called upon, as they fly to space, land on the asteroid and attempt to destroy it by drilling into its core and planting a nuclear bomb deep inside. The team have only 18 days to plan the mission with NASA and save the world from doom. With a knockout cast… Bruce Willis, Ben Affleck, Liv Tyler, Billy Bob Thornton, Michael Clarke Duncan, Owen Wilson, Steve Buscemi, William Fichtner etc… (One of the best casts in movie history, if anyone was to ask me!) and Michael Bay as director, ‘Armageddon’ could only be incredible. 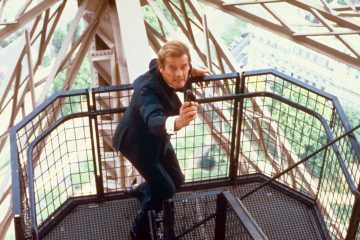 With its mix of spectacular action, special effects, comedy and romance, it is one of the silver screen’s great blockbuster movies. Where ‘Deep Impact’ attempts to keep things grounded in reality, and saves a lot of the big visuals for the finale, ‘Armageddon’ goes in the opposite direction entirely. The science is bonkers, the 18-day timeline is hilarious, and the fact of a roughneck drilling crew being trained as astronauts in that timeline is even more hilarious. And that’s where the fun is. You could never find a more lovable and more enjoyable bunch of misfits, as they fight their way through the horrendous dangers of space to save their fellow men. A lot of the love I personally have for the movie is for those guys. 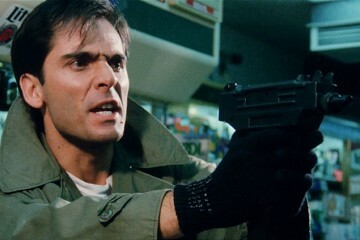 Idiots, criminals, psychopaths, but braver than any other men I’ve seen in a movie such as this. The adventure they undertake is beyond belief, as they fight to survive against the terrain of outer space, with malfunctioning equipment and a team of NASA experts back on Earth ready to put their “Plan B” into effect before the end of time. As for the action and the visual effects. This is a Michael Bay movie. Characters are very important, of course. But we need Bayhem. 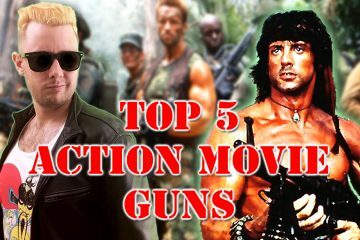 And although we had the glorious ‘Bad Boys’ and ‘The Rock’ (The greatest action movie ever made! ), ‘Armageddon’ was the birth of Bay as a blockbuster lunatic. Armed with a budget of $140 million (Thanks to the massive success of his past movies), he was determined to show exactly what he’s capable of, when it comes to blow-em-up cinema. Roland Emmerich had, two years before, released the first of a new generation of action blockbusters with ‘Independence Day’, which became the second highest grossing movie ever made at that time. So naturally every movie studio in the world decided to hop on board the bandwagon with several big budget disaster blockbusters. We’d had the classics, such as ‘The Towering Inferno’ and ‘Earthquake’, but in the new age and with new technology, ‘Independence Day’ was the first, along with several others following after, like ‘Dante’s Peak’, ‘Twister’, ‘Volcano’ and ‘Daylight’. 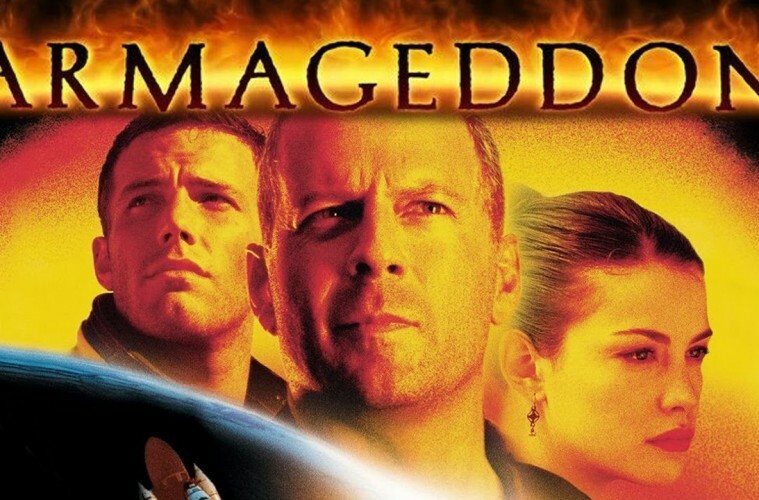 With ‘Armageddon’, this was Bay’s first attempt at a truly gigantic blockbuster, with massive set designs, CGI and a level of action never seen before. And he succeeded. While the story and characters are tons of fun, the action has its own identity. The opening meteorite attack on New York is spectacular and devastating, along with the destruction of entire cities and countries later on. And the space scenes are mind blowing. The two shuttle destruction scenes are highlights, and the intensity and excitement of the drilling crew finally landing on the asteroid is unbearable. This was the Michael Bay of the future, the man who would eventually go on to helm the truly fantastic ‘Transformers’ franchise. 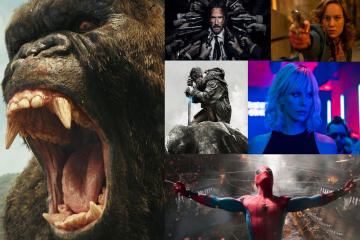 Disaster movies make up one of the best genres in action movies, and we have to thank Michael Bay and Roland Emmerich for bringing it back into the mainstream again. 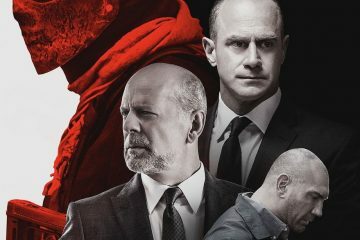 The cast are all brilliant, but Bruce Willis as team leader is very much the star. He owns every scene he’s in, and ‘that’ scene at the end of the movie is still one of the most moving and well made scenes to feature in a movie like this. Ben and Liv are also very sweet as the young couple in love, playing the romance well, but also providing a lot of humor and emotion to the story. Everyone else is perfect. Like I mentioned earlier, one of the best casts, and one of the best bunch of movie characters. The music of ‘Armageddon’ is some of the best I know of. From the thrilling and emotional score by Trevor Rabin, to the awesome and iconic rock ballad ‘I Don’t Want To Miss A Thing’ by Aerosmith (Written by the legendary songwriter Dianne Warren, who would go on to write the theme song to Bay’s next movie, ‘Pearl Harbor’. The beautiful ‘There You’ll Be’, by Faith Hill, the greatest woman in music.). The soundtrack also features a terrific song by Journey, titled ‘Remember Me’ (Which can be heard briefly in the taxi cab scene in the opening sequence) and a lovely version of John Denver’s classic ‘Leaving On A Jet Plane’. Music is a very important aspect to Michael Bay’s movies, and ‘Armageddon’ some of his best. The movie’s main theme still gives me chills of excitement. 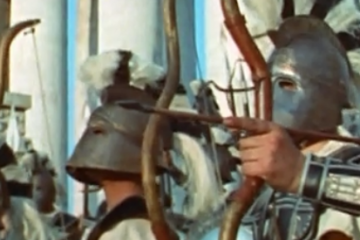 One last special mention must go to Charlton Heston, for that opening voice over. Wow. It still gives me goosebumps. It sets the movie up perfectly. Heston had a wonderful voice. 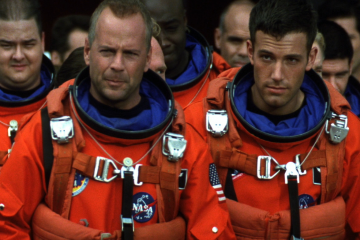 17 years later, ‘Armageddon’ is still one of the finest blockbusters anyone could see. Extremely dumb and way over the top (Which I’ll always love in movies! 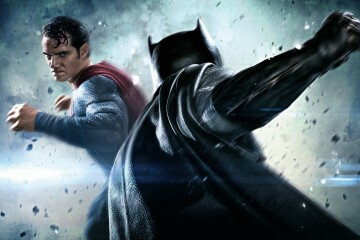 ), but very wonderful, very exciting and boasting some of the greatest action and effects we will ever see. Bayhem reigns supreme! Coming next, Michael Bay’s first attempt at telling a true life story, with his sweeping romantic action epic ‘Pearl Harbor’. Previous ArticleTHE CAST OF 'HATEFUL EIGHT' TAKE US THROUGH THE HISTORY OF THE "ROAD SHOW"